Craig Close as with Allan's Close was demolished in 1932 to incorporate an extension to City Chambers therefore the upper part of this close no longer exists. A once residence, Andrew Hart, brought out an addition of the Bible here in 1610. 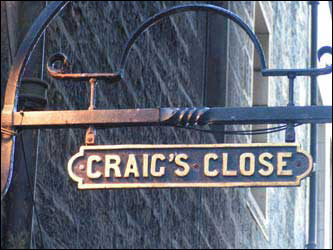 Both Robert Burns and Walter Scott had associations with Craig's Close. The Isle of Man Tavern was located here and frequented by Robert Fergusson, Henry Raeburn, Deacon Brodie and Alexander Runciman. The early Scotsman Newspaper Offices were also located here.